Detroit is closer to figuring out how to address a hole in pension funding that is far larger than it had anticipated when it exited from bankruptcy. The city in March put out requests for proposals seeking national firms with expertise in public pension plans to advise the city on how best to address a $195-million payment to the city's two pension plans that comes due in 2024, under terms of the city's exit from the nation's largest Chapter 9 municipal bankruptcy. John Naglick, the city's deputy chief financial officer and finance director, told the Free Press that a committee of top officials in the Duggan administration reduced a pool of proposals to three and recently recommended one firm to the city's CFO, John Hill, who approved the suggestion. Detroit's bankruptcy exit plan, approved in December 2014, gave the city breathing room before it had to make payments to its two pension plans — the General Retirement System and the Police and Fire Retirement System — on the assumption that the city would be better able to pay once its tax base recovered post-bankruptcy. The bankruptcy blueprint called for Detroit to begin making pension payments with a $112.6-million installment in 2024. The city now says that actuarial assumptions used in the bankruptcy were inaccurate and outdated. City officials said that new actuarial reports last year by the Gabriel, Roeder, Smith & Co. firm project Detroit may have to pay $491 million over a 30-year period beginning in 2024, including the $195-million payment the first year. Experts have long warned that the City of Detroit could be felled again if it failed to address its pension obligations, even as the city was set to emerge from bankruptcy free of $7 billion in long-term obligations. "Making higher contributions to the pension plans is the primary option to address the shortfall," said Matt Butler, vice president and senior analyst on the local governments team for Moody’s Investors Service. "Doing so would likely require revenue collections that outpace the city’s post-bankruptcy projections. The city has indicated that strong revenue collections may enable it to make a higher-than-budgeted pension payment this year." The shortfall, first reported by the Free Press, came from the firm Gabriel, Roeder, Smith & Co., which discovered that bankruptcy advisers used outdated life-expectancy tables — estimates on how long retirees will live to collect their pensions — in projecting the city’s total pension obligation. The lower pension obligation estimate for the city used in the bankruptcy plan was based on other outdated information, including a number that failed to anticipate that the city would be hiring employees after filing for bankruptcy who would need to become part of the pension system. The old calculations were also based on pension cuts taking effect in June 2014, instead of nine months later in March, which underestimated the liability for the pension system, officials from the firm told its Detroit pension fund clients. Actuaries advising the pension funds have insisted there is a significant risk of keeping to the original payment schedule and not adding more money: "Every potential action" should be pursued, Gabriel, Roeder, Smith said in an October report, to provide additional funding into the funds well before 2024. ​The revised estimate still counts on the pension funds’ assets earning 6.75% a year on its investments agreed to by the city's emergency manager and pension officials in bankruptcy mediation talks. But the pension funds have struggled recently. A lower average rate of return over the next several years could further inflate the city’s pension fund obligations starting in 2024 and beyond. Those numbers are not expected to be set until the new consultant hired by the city has a chance to test the assumptions made by Gabriel, Roeder, Smith in its reports last fall. Gabriel, Roeder, Smith is also expected to provide the pension funds a new valuation report by next month that comes up with an updated estimate of the city’s unfunded pension liability. While teachers at Michigan’s largest school district were living under a wage freeze, and more recently hearing rumors of possible payless paydays, one school employee who is also president of the local teachers union got a huge raise. That district is the insolvent and academically challenged Detroit Public Schools, and the union president is Ivy Bailey of the Detroit Federation of Teachers. Bailey was listed as a teacher in 2013-14 and earned $70,176. Her salary shot up 31 percent to $91,877 in 2014-15. Bailey’s compensation is listed in a state salary database of employees enrolled in the school employee pension system. It’s unclear why she was given such a big raise. Michigan Capitol Confidential puts in Freedom of Information Act requests for salary data at the beginning of each fall school year. Some union contracts call for pay increases after the school year has ended. In 2014-15, Bailey earned $37,742 for teaching and received another $36,381 for, according to the pension database, “other professional business” and $17,754 for “employee professional services leave.” It's not clear what "other professional business" refers to but like Bailey's union pay, it does count in the calculations of her public school employee pension. The average salary of Detroit Public School teachers was $63,716 in 2014-15, according to the Michigan Department of Education. That's the most recent data available. DPS has allowed individuals on the district’s payroll to do union work while clocked in as a district employee in a setup known as “union release time.” In many cases, the individual gets a union salary that can be used to boost an eventual payout from the underfunded school pension system run by the state. As of this school year, DPS had seven employees who were being paid for union work that counted toward their school pension calculations. Teaching summer school is a big one, although it's not clear how that would be listed on their website. If a teacher supervises Saturday School or the school-wide after-school detention, that is extra money too. Internal subbing is also pretty generous extra pay for teachers. The unions tend to really jack up what the district must pay for internal subbing. Most teachers *hate* doing it, and the district always thinks that "next year we'll have enough substitute teachers, so we won't end up paying it anyway" so the rate skyrockets. (Internal subbing means that a teacher gives up their planning period in order to substitute that period for a different absent teacher. If the absent teacher teaches 5 classes, the district might have 5 different teachers cover during their planning periods. Regular full-time teachers, not actual substitute teachers.) Some districts have preference lists where teachers can say "I need the money, I'm happy to internal sub: call me first if there's a need" or "God no, I hate internal subbing even at the union rate of pay: call me last". So if you preferenced to internal sub you might get called a lot. Department heads make a little extra money also, and I don't know how that would be listed. If they're doing some other kind of district work over the summer, that might also qualify for extra pay. Offhand I'm not sure what that might be, but there could be stuff. (maybe interviewing teacher candidates?) If the school got a grant for something, there could be extra pay for teachers involved in the grant. Particularly an award of some sort might have some extra pay involved. $36,381 seems like an awful lot of extras, but if she was picking up every extra it's definitely possible. Last edited by twig93; 06-03-2016 at 10:10 AM..
Yep, at my wife's high school varsity coaches get I believe like $9k of extra pay, assistants about half that. Throw in summer school options, where for example my wife was asked to teach at a local extremely large junior college for one class taking up 5 weeks and that was an extra $5k+ or so. These things can add up if someone is attempting to max out their situation. In other examples some departments may be short staffed and ask teachers to pick up an extra class, say 6 instead of the usual 5. Figure $20k per class on average and right there you are +$20k. So in my three scenarios someone can be at +$34k above their usual salary. Jamie Fields, a retired Detroit Police Department deputy chief and an attorney for about 160 retirees, said Monday that Moore, a Clinton appointee, validated his legal battle in her dissent. “With all the people who said we were crazy for filing this, at least there was one judge who said they agreed with me. I feel some vindication that one person didn’t say I was crazy,” he said. Fields said he will ask for the full appeals court to hear the case. “The next step after that would be to take it to the Supreme Court. The odds of them taking it are small, but the retirees deserve it, and we have no choice but to go forward,” Fields said. Detroit Mayor Mike Duggan declined to comment at an afternoon jobs event since he had not seen the ruling. Detroit Corporation Counsel Melvin Hollowell also declined comment on the ruling. The court’s decision to reject the pensioners’ claims comes as the city approaches the two-year anniversary of the bankruptcy this December. In September, the city met a post-bankruptcy milestone with the state-mandated Financial Review Commission saying the city was in compliance with the commission’s annual requirements to meet financial milestones. If an audit in January confirms it, then the city would have just one more fiscal year to demonstrate good budget practices, and the state would consider lifting the demands that an outside board approve Detroit’s spending. The ruling could be one of the last remaining legal fights from the landmark case, which had multiple appeals pending in the U.S. Court of Appeals in the past 18 months. Nine appeals listed on the docket indicated all those appeals have been closed. Under the deal dubbed the “grand bargain,” state money was used to support Detroit’s pension funds and donations from private foundations and the Detroit Institute of Arts were used to protect city-owned masterpieces from being sold to raise money to pay creditors. William Davis, a named plaintiff in the suit, said Monday the battle is not over for pensioners like him. Last edited by campbell; 10-04-2016 at 01:31 PM..
DALLAS – Two years after exiting the biggest bankruptcy in municipal history, Detroit still faces challenges including an unexpected gap in pensions and the absence of a long-term economic plan that leaves the city vulnerable to further setbacks. The city marked the anniversary of its exit from bankruptcy on Dec. 10. City leaders continue to hold the line on spending and, after registering a solid 2015, appear to have posted another positive year in 2016, although audited figures are not yet available. "Frankly, there wasn't much room for the city to go but up," said Howard Cure, director of municipal bond research for Evercore Wealth Management. "For the city which is invested in autos, I am not sure if they are fully going to participate in an economic recovery or conversely just how vulnerable it is to an economic downturn." The latest report filed on Nov. 29 from the Detroit Financial Review Commission, which provides oversight of city finances, estimates a general fund surplus of at least $41 million for fiscal 2016. The nine-member group, established under the so-called "Grand Bargain" legislation that drove the bankruptcy exit plan, is charged with ensuring that Detroit stays on course by reviewing borrowing, some contracts, and long-term fiscal plans. The figures are based on budget projections as of Aug. 15. The city also expects to finish the fiscal year ending June 30 with a general fund surplus of about $30 million based on budget projections as of Nov. 16. Still, worries remain in the forefront and the city’s rating remains deep in junk territory at B2 and B from Moody’s Investors Service and S&P Global Ratings, respectively. Under the "grand bargain," which leveraged civic foundation support to form a relief package for the bankrupt city, Detroit reached settlements with its pensioners that left intact public safety monthly checks and imposed a 4.5% cut on general employees. Their cost-of-living increases were reduced or eliminated. Retiree health-care benefits were slashed by almost 90%, allowing the city to shed a $4 billion obligation. At the time the pension plan was underfunded by more than $1.8 billion, and retirees would have been subject to a 27% reduction. The $816 million gained from the city's bankruptcy deal reduced the reduction in benefits to 4.5%. There's really no telling what Amazon CEO Jeff Bezos really wants in the city that will host his online retail company's second North American headquarters. But if he's looking for a city in the Rust Belt that has already confronted its unfunded 20th century promises to municipal workers, some Detroit leaders think they've got a distinct advantage over rival northern cities, especially debt-ridden Chicago and the state of Illinois. "One of the things Detroit needs to promote is unlike so many other communities, we've cleared our legacy costs," said Eric Larson, CEO of the Downtown Detroit Partnership. "You think about Chicago, which is great competition, but the reality is they have a very significant pension liability that they're going to have to deal with pretty soon. And that's going to be all-consuming, just like it was for us." Simply put: Detroit already went bankrupt! And in the process of that historic and tumultuous 17 months in 2013 and 2014, Detroit dumped $7 billion in liabilities in bankruptcy court, mostly through the elimination of an unfunded and generous retiree health care benefit. Most pensioners received modest haircuts, and a couple of bond insurance companies absorbed the rest of the losses on money Detroit borrowed to obscure its own pension-funding crisis. The $816 million "grand bargain," an unprecedented infusion of cash from philanthropy, corporations and state government, spared most pensioners from double-digit reductions in their monthly checks. It also absolved Detroit of making full pension payments until 2024, giving the city a decade to get back on its feet financially as reinvestment into the center city started to pour in. As state and Detroit officials found out in the years running up to the bankruptcy, the city's inability to borrow money at reasonable rates affected everything from fixing broken infrastructure and ambulances to cash flow for making payroll. Those are factors any business considering an investment in Detroit had to weigh at the time, Arwood said. "Detroit can present a completely different picture on the future," said Arwood, CEO of Miller Canfield Consulting, a subsidiary of the Detroit-based law firm Miller Canfield Paddock and Stone PLC. In evaluating cities, Arwood said, Amazon's brass should be asking, "Does your community have its fiscal house in order?" "If the answer is no, that could be translated into higher taxes for you," Arwood said. "And you don't know when or how much." Did city government bankruptcy hurt Detroit’s economy? The City of Detroit filed for Chapter 9 bankruptcy protection in July 2013. How has Detroit’s economy done since then? Chapter 9 is part of the federal bankruptcy law, providing relief to financially distressed municipal governments from creditor demands. Pros and cons of going down this route are hotly debated, and some parties warn of the threat to the local economy due in part to reduced trust among creditors. This post is not meant to be an exhaustive analysis of the Detroit experience. But looking at employment data, it seems difficult to make the case that bankruptcy hurt economic growth. The chart below shows total employment from 2005 to 2017 in the Detroit-Dearborn-Warren metropolitan statistical area, compared to employment in the Chicago-Naperville-Elgin metro area. 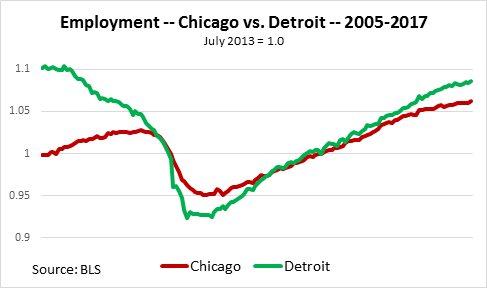 The chart indexes employment in both areas to July 2013 = 1.0, which gets both areas (one larger than the other) in the same neck of the woods in the chart and also allows you to compare the Chicago and Detroit metro areas since the latter declared bankruptcy. Employment growth in Detroit has outpaced growth in financially challenged Chicago, where in recent years growth appears to be slowing down. A year before Detroit declared bankruptcy, Stockton, Calif., declared the then-largest municipal bankruptcy in history. Comparing employment in Stockton to employment in Chicago since that bankruptcy tells a similar story. This is only employment data, but comparing Detroit to Chicago on a broader measure of “GDP” from 2005 to 2016 (the latest year for which GDP data is available) also suggests it is hard to make the case that declaring bankruptcy hurt the Detroit area.